Yes, yes, I still have chocolate to review from the Chiles & Chocolate Festival a couple months ago. Now that Christmastime is over, hopefully I can quickly get the posts up for the last of these. When I saw that The Chocolate Smith, out of Santa Fe, would be at the festival, I was excited. Years ago, when I was writing for Chocablog, they sent me quite a few of their products, including some of their wax chocolate. They call the wax chocolate weatherproof chocolate: it's ganache dipped in cheese wax, so you can carry it with you in warm weather here in the Southwest without it melting in the same (quick) way that a bar of chocolate would. I'd loved the wax chocolate before, so I couldn't wait to get some again (as you know, I don't normally order chocolate online). Turns out, though, that they didn't have any wax chocolate at the festival. Instead, they had plenty of displays of chocolates and chocolate bars and chocolate covered nuts. Given that I came in wanting a certain product and that I also didn't want particularly to get anything with chile in it (Chiles & Chocolate Festival or not), I just couldn't make up my mind on what to get. (Also given that I was buying from so many different companies that I couldn't get much from each one.) So I decided to just go with the most random item on the table, a bar of Paris Tea Dark Chocolate wrapped in a paper lace doily and tied with a blue string. Definitely not a typical Chiles & Chocolate choice. But I do love my tea. This is the type of bar where there isn't really a front and back. The front is the side with the full label, right? 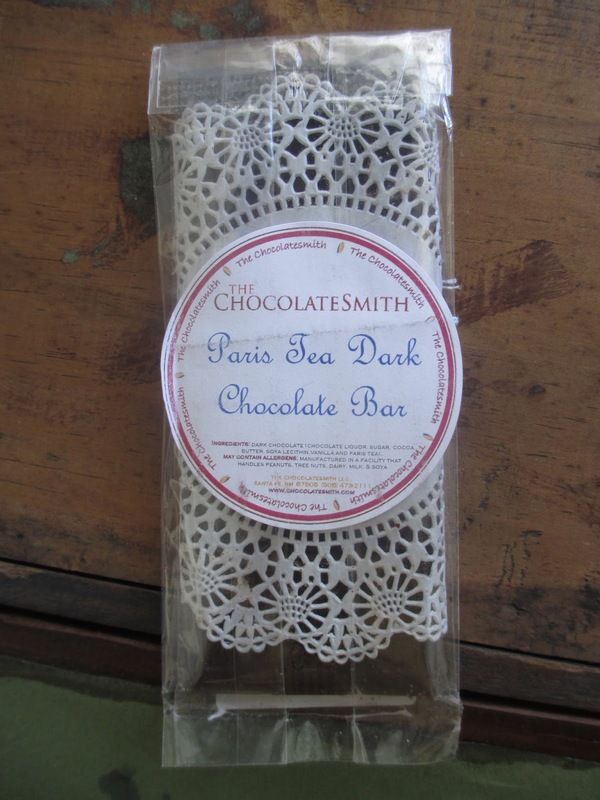 But there is also a small label on the back and the back is equally appealing-looking with the frilly edges of the doily and all of the loose tea showing on the chocolate's surface. Nice and feminine and pretty. The chocolate here lies somewhere between sweet and dark; it's similar to Ghirardelli in that way. Not sweet sweet and definitely not bitter, either. Now, tea doesn't always make for a strong flavor in chocolate. I remember reviewing a yerba mate chocolate bar oh, about seven years ago that hardly had any recognizable yerba mate flavor. Similar situation here--sometimes. Sometimes I don't taste the tea at all. Sometimes I'm not sure if I'm tasting vanilla from the chocolate or from the tea. And sometimes I do get the aromatic tone of Paris tea. Other times I feel like I can sense the tea most after the chocolate has melted. Part of this likely happens, as well, simply because the flavors in Paris tea are flavors that tend to already come in chocolate. Vanilla and fruit notes. On some bites, when I do get a lot of the tea, I get a strong fruitiness that feels like it's coming from the chocolate but must be coming from the tea. And, you know, Paris tea happens to be one of the most delightful black tea blends. 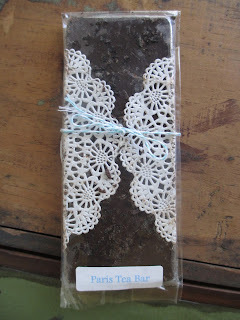 So getting even some of the sense of the flavors of this tea into a chocolate bar is nice and pleasant. Let's go with that: nice and pleasant. Maybe not as unusual as ganache dipped, cheese-style, in wax. Yet still pleasant.